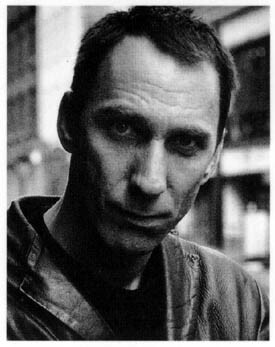 Although, at 39, Will Self is approaching mid-life and he can see the “lowering storm of age and extinction” ahead of him, there is still certainly nothing in his prose or his physiognomy to suggest that he will become flabby or paunchy. Indeed, even though his new novel How The Dead Live is divided up into sections of “Dying”, “Dead” and “Deader”, Self has if anything attacked the page with even more vigour and purpose than before. So it’s rather reassuring to see Self looking very healthy, tanned as he is from a holiday in the Canaries, reassuring also that the Coke he orders comes in a glass with ice. We meet at the Groucho Club in Soho, London, one of Self’s former haunts but which he says he hardly ever visits anymore. Outside he crouches down to chain his 22cc Go-Ped Bigfoot – a small motorised scooter – and strides into the bar wearing a black leather jacket, crisp white shirt and a pair of well-worn brown Chelsea boots to go with his new cropped haircut. How The Dead Live is a mordant and disturbing allegory of life after death and death in life, which derives some of its structure from The Tibetan Book Of The Dead. Of course, Self has used that particular book in his fiction before: “The North London Book Of The Dead” from The Quantity Theory Of Insanity and a chapter in My Idea Of Fun. But whereas “The North London Book Of The Dead” was about the failure of a young man to come to terms with the death of his mother, How The Dead Live is very much an objective description of what happens to someone in the after-death plane. That someone is Lily Bloom (an evocative name, encoding notions of life and death), a 65-year-old American anti-semitic Jewish wiseacre who at the beginning of the novel lies dying of cancer in the Royal Ear Hospital in London. It is a Self-like irony that it’s a stiff who provides him with one of his most fully realised characters, especially given that he has been dismissive of the very notion of character in the past. Self wanted to call the book Deader, but his French translator persuaded him not to, and instead suggested the eventual title, which is also the title of a French film from 1999. When Self was sitting in his study one afternoon mulling this all over, the title of a Derek Raymond book (aka thriller writer Robin Cook) swam out at him, and then, he says, he really did have some agonising over it. “How The Dead Live isn’t perfect for the book,” he admits, and says that initially he wrote an exculpatory forward explaining why he’d chosen the title. “But then, I very much wanted to take my voice out of this book. I wanted How The Dead Live to just happen in the reader’s mind, decoupled from any presuppositions about any framing of the text in that way.” Once again, it’s a novel where the moral fulcrum is someway off the page. Although Martin Rowson’s endpaper maps attempt to locate the fictional topography of How The Dead Live the world it describes is very much filtered through Lily. In other words, as the preface from The Tibetan Book Of The Dead says, it takes place on Lily’s “mind stage”. Lily’s venom and disgust, her vitriolic wit and bile is well sustained over the 400 pages,.but the ultimate effect is one of poignancy, of playing to the empty gallery as she clings to her personality. With his latest novel, Self has gone to the core of the belief that the essence of the self is the personality. I ask him about the novel’s fantastically bleak ending, where Lily is reincarnated as her junky daughter’s junky daughter. “Yes, it’s certainly not up and light is it?” he says mockingly, drawing hard on a white filtered cigarette. “The end acquires this ineluctable and dangerous feeling logic that did surprise me. I hope people will feel that the back end of the novel is like a whirlpool, like some Edgar Alan Poe story dragging you in. In fact, as a look through a collection of his cartoons in 1985 for the New Statesman called Slump will reveal, while he is no Ralph Steadman or Gary Larson, he is being unduly modest about his self-taught cartooning skills. Slump is a witty, charming and caustic look at life through the lens of a man who decides never to leave his bed. Does he read any “invisible literature” in JG Ballard’s phrase? “Oh, what Black Box Flight Recordings? I don’t want to read that. I’m terrified of flying at the moment,” he says anxiously. “But, no, I don’t find the poetic at quite that level. I love reading books about a fact, whatever that fact may be. Of the Internet as anything other than a high-speed research tool and messaging system, Self says that he is uninterested. “McLuhan was wrong, the medium isn’t the message. It’s another device that allows one to suspend one’s disbelief.” Another fact that could almost be a conceit in his own fiction is that Self’s name is “semantically camouflaged” as far as the internet is concerned. Indeed, most search engines will discard the “Will” leaving you with a list of self-help books, etc. On the subject of his name, which a lot of people still seem to think is a nom de plume, Self tells me that if you look at the credits of old “Batman” episodes you’ll see that the producer was none other than William Self. Indeed, Self continues to crop up in similarly obscure areas of TV: “I’ve been in the credits of ‘Brass Eye’, ‘The Day Today’ – ‘horse ripping by Will Self’,” he says proudly, being a big fan of Chris Morris. Is that horse in the sense I think it is (heroin)? “It could be, knowing Chris. I hadn’t thought of that actually.” He even gets a mention in “Father Ted” as someone who reads Brick magazine. For anyone who saw the Channel 4 discussion programme “Something of the Night” (re Ann Widdecombe’s comment about ex-home secretary Michael Howard) with Self presenting, he says that it’ll be the last time he does anything like it again: “It was ill-advised. The anchor role really vitiates against being radical or presenting an alternative voice.” Which is a shame in a way because, for all Self’s obvious discomfort, it was very entertaining to have him try and steer a path between voices as diverse as Martin Amis, Paul Johnson and Tracey Emin (who was embarrassingly drunk for the second time in as many weeks on a TV programme).